The summer holidays are 6 weeks long - lets face it there are going be times when you have nothing to do. Well with these two new books: The Anti-boredom Book of Brilliant Things To Do by Andy Seed (author of the book The Silly Book of Side-splitting Stuff - a past blog post) and How To Write A Story by Simon Cheshire. The Anti-boredom Book of Brilliant Things To Do (wow what a mouthful lets just call it TABoBTTD for short) is a great book. Like it's brother The Silly Book of Side-splitting Stuff this book is totally hilarious and I definitely recommend TABoBTTD to any lovers of that book. TABoBTTD is full of great boredom-busting ideas for you, your friends and your family to try out. It has mini games throughout the book like rate these from 1-10 and quizzes asking True or False. There are also questions like what would you do if you were King/Queen for the day. This book has everything to keep you occupied for a long, long time wherever you are, whoever you are with and whenever you feel like it. If you love funny things then you'll love this whether you're 5 or 100!!! 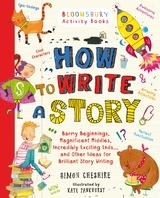 How To Write A Story is again a great book for curing boredom. It is great for wannabe authors like me with tips on the structure of your story, cool characters to put in and how to build an awesome plot. This has lots of games in the book such as coming up with an awesome character and drawing a description and then get a friend to draw their interpretation of the scene - it's funny how different your sketches are!! So if you're a blogger or a fan of writing stories this book is for you and who knows that book could lead you to fame and fortune! Both these books are great and I highly recommend them. Now you won't be bored this summer: a win for you and those parents who are sick of those many times they hear the phrase 'I'm Bored! ', that's one thing you'll never hear again. I'd like to say thanks to Charli from Bloomsbury for sending me these brilliant books.